Took me forever to checkout, but completed through Paypal. Damn, I'd love that Tim Doyle Seinfeld print from the last page. That thing is awesome! Anybody else take a shot at the Olly Moss Super Mario prints today? I was able to snag a variant (red) and can't wait to see it in person. Good job. Those Moss drops are tough. Nice! 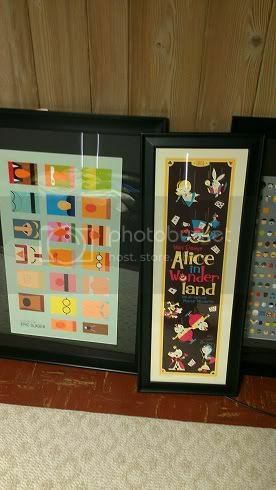 I passed on the Alice cause I have the old small cheapo digital print version from Perillo's Etsy store, but love what they did with the expanded one. I definitely would've went for it if it wasn't a 36"er. I bet it's gonna look awesome! Drop should be very soon, they just took stuff off the shop page. Man, I missed the 300 by a few seconds. Sold out while I was in Paypal... Beautiful print, really bummed I missed it. So if you want the Stout Star Wars set or the Moss Star Wars set on the cheap and at a smaller scale, Topps has reprinted them in their Star Wars Galaxy 7 card set. Any Target should have them. I got both of my Dave Perillo's framed (sorry Whalen, tubes for you). This cosmic Mondo poster will be given out free to those devoted fans who are so eager to visit Mars that they attend IMAX midnight screenings in the first hours of March 9. The offer is good only while supplies last, and you should check the soon-to-be-posted list on IMAX’s website to see if your nearest IMAX theater is among the select sites participating in the giveaway. scored my first poster tonight! I picked up Hugo variant and got hooked up with Bullhead. Looking forward to some in store releases during SXSW at the new gallery. I haven't wanted anything from Mondo lately except Dracula. Nothing much has interested me either. I did pick up the Hugo regular (too slow for variant) but this has been the first piece in 3 months that I tried for. Congrats to everyone who got what they wanted though. Grabbed Rango and Bridesmaids. The Whalen was a given for me, but I picked up the Bridesmaids because I also really like Perillo and I'm happy to see Mondo putting out something of his. The movie itself...not so much. Finally got this one back from the framer. Normally don't like colored frames, but like how it looks like her outfit. Very nice. Framing is the one thing I really hate about collecting these. 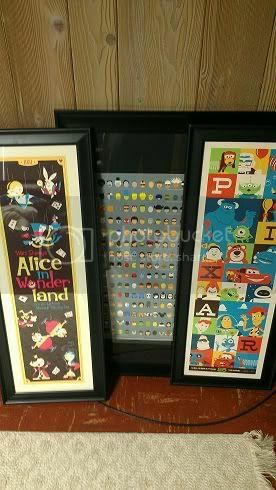 Costs 4 times as much to properly protect and frame one than to buy one from Mondo. that is damn cool Ben! I got one tonight at the LA Times Hero Complex screening! I was worried during the first act, but then it clicked for me. It's definitely epic in scope and visuals, and worthy of a great IMAX screening. I wonder if the magical red drawers made it over? Jesus...how many threads are you gonna put this in?! I think they will be there and possibly even more. And SterlingBen can put that Kill Bill in as many threads as he wants. It's badass. Hell he should really get that seen and put it in Mhg83s dating thread in otter!